Photo courtesy of Flickr / www.directline.com. Unless you're a medical professional, you probably have no idea what injuries tend to be the most common in every state. But the researchers at healthcare information website Amino have figured it out — and it turns out we're suffering from a disproportionately high number of animal bites in Missouri compared to the rest of the country. So why is that? In some cases, the commonality of an injury in a state could be due to increased awareness, such as the disproportionate number of concussions in Massachusetts, which has a highly educated population and a lot of careers in healthcare. And suffocation, for example, could be more common in mountain regions in light of their topography. Here in Missouri, we can only speculate that our longtime status as a major hub for puppy mills could be a contributing factor. We've also got a feral hog problem. Could that be driving our disproportionately high number of bites? Suffice it to say, the great outdoors can be dangerous. Many states in the middle of the country were home to a wide variety of physical injuries, including "unspecified facial injury" in Illinois, "unspecified arm injury" in Iowa and "motor vehicle accident" in Arkansas and Tennessee. Bug bites are common in Kansas, as well as Texas, North Carolina and Virginia. Note that these aren't the most common injuries in each state — just the injuries that Amino reports as disproportionately frequent. 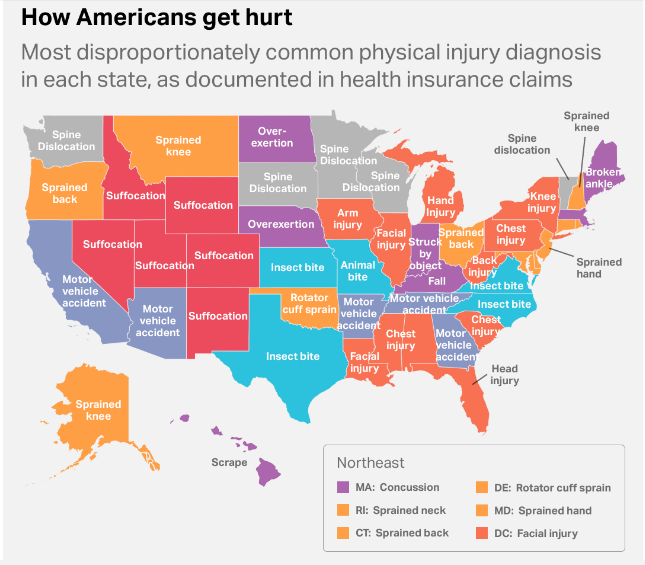 Bruising and open wounds to be the most common injury in nearly every state, which would make for a much duller report. Read about the entire study at amino.com.